The nuances of the law are often a mystery even to sophisticated potential clients. Moreover, developments that are considered groundbreaking among attorneys and legal academics often pass with little or no media attention and public awareness. A regularly updated, high-quality law firm blog allows your organization to demonstrate its ongoing mastery of important legal issues by presenting them to potential clients via social media. A legal blog produced by Raising the Bar Media shows your clients you are committed to staying on the cutting edge of legal developments and are able to communicate how these developments affect them in terms they can understand. 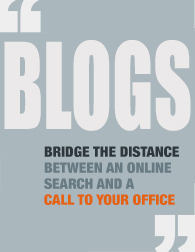 This can often be the difference that bridges the gap between an Internet search on a particular topic and a phone call to your office to schedule a consultation.